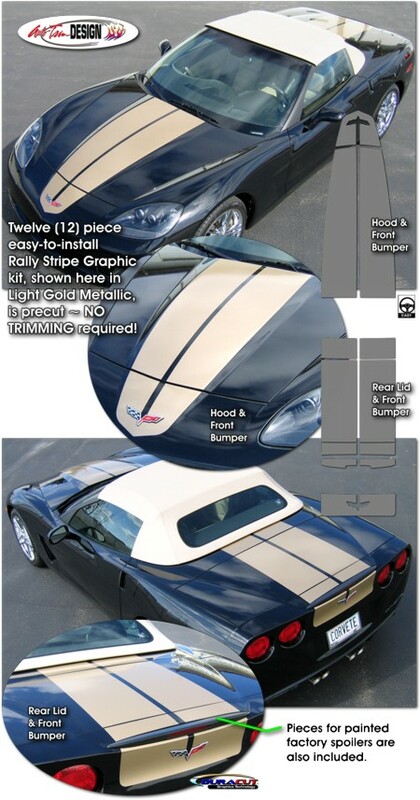 Make your Chevrolet Corvette C6 look great with this Hood, Roof and Rear Deck Lid Competition Sport Stylized Rally Stripe Graphics kit. This stripe package is not just a set of straight strips in a box. Our graphic kit consists of prefitted and contoured pieces as shown in the illustration. This kit is specifically made for the '05-'13 Chevrolet Corvette C6 Coupe, Convertible, Grand Sport or Z06 and will not fit any other vehicle. Convertible Waterfall Trim Kit (ATD-CHVCRVTGRPH68), if selected, uniquely finishes off the Roof Cover area within the passenger area of convertible models. 'Click' Here to view the Parts List for this item.